Hawaii is vulnerable to tropical storms, tsunamis and other natural disasters. With hurricane season in full swing, now is a great time to prepare for potential emergencies. September is National Preparedness month and quality disaster planning takes every possibility into consideration including the safety of pets. In the case of a natural disaster, the most vulnerable areas are low-lying and beach or stream areas that can be flooded, and hillsides, which can have landslides after heavy rain. Those residing in high-risk areas should arrange in advance to stay with a friend who lives on higher ground. It's also advised that if you are planning to leave for a friend's, leave early-don't wait for mandatory evacuation. An unnecessary trip is far better than waiting too long to leave safely with your pets. If you wait to be evacuated by emergency officials, you may be told to leave your pets behind. It's critical to remember that the single most important thing that can be done to protect pets is to take them along if owners evacuate their home. Animals left behind in a disaster can be injured, lost, or killed. Animals left inside a house can escape through storm-damaged areas, such as broken windows. Leaving dogs tied or chained outside in a disaster may endanger their lives. Animals turned loose to fend for themselves can become victims of exposure, starvation, or accidents. Even if you decide to leave for just a few hours, take your animals. Once you leave, it's impossible to know how long you may be kept out of the area, what traffic and hazardous conditions might prevent you from returning. It's important to note that pets are not permitted in public emergency shelters so families must plan. Those who evacuate to a shelter should take their pets along. As a last resort, pets can stay in their owner's car parked in a protected and shaded area at the emergency shelter. 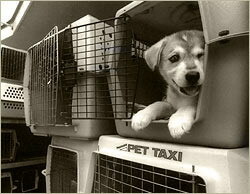 Pets should be housed safely in their carriers equipped with food and water. Car windows left slightly open will provide ventilation but keep out the rain. As soon as it is safe, check on the animals. If you think you may board your animals, check out local veterinary clinics and boarding facilities ahead of time to inspect the kennels. Many boarding facilities require proof of current vaccinations so ensure that shots are always up to date. The kennels should be located out of the hazard area and have a plan for emergency evacuation. Families with pets who live on higher ground and opt to stay at home during an emergency should determine the safest place away from windows and breakable objects. Pets must be brought indoors well ahead of time. If the thought of a natural disaster seems like a prescription for anxiety, the best remedy is a well-thought out plan that keeps your family including your pets protected and safe. In the event, a pet is missing, a report should be filed immediately with the Hawaiian Humane Society. The 24-hour phone number for reporting lost and found pets is 946-2187, ext. 284. Facilitate identification by providing a pet photo. Reclaim lost pets at the shelter, 2700 Waialae Avenue in Moiliili, open noon to 8 p.m. Monday through Friday, 10 a.m. to 4 p.m. weekends and holidays. The shelter's incoming animal area is open 24 hours to accept lost or injured animals. A carrier (or pet crate) for each pet. Before a disaster strikes, teach pets that a carrier can be their safe haven. The crate should be large enough so the pet can stand up and turn around inside it. Collar and leash. A properly fitted collar is essential for dogs and handy for cats. Keep collars and leashes ready ahead of time near the pet crates. Identification. Animals should wear an ID at all times. Keep current photos and ensure all cats and dogs have microchips. Owners who have moved or changed phone numbers should update their contact information at www.hawaiianhumane.org. Vaccination records. Keep pet vaccinations up-to-date, and have veterinary records near carriers. Many kennels require proof of current vaccinations. Supplies for three days. Set aside dry pet food and kitty litter as well as newspapers, plastic bags, paper towels and cleansers to handle pet wastes. Include non-spill bowls for water and food, medications, and jugs of fresh water for pets.